Burma, possibly becoming Myanmar. Rangoon, returned to being Yangon. 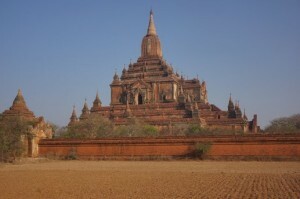 Bagan, a countryside of ten thousand temples trying to imagine and prepare for the treasures of tourists. Mandalay, risen and fallen and rising again now with a population said to be 40% Hunan Chinese. I think the only preparation for being in Southeast Asia is to have been there before. Double that for Myanmar. In Yangon, the point of arrival for most, is one of the loveliest temples on earth — the magnificent Shwedagon temple. It outshines anything else we saw in the five weeks of temple trolling that followed: great outdoor reaches of tile and stone, gold and white, enormous, spotlessly clean and filled with devotion — to such of mix of Buddhism, Hinduism and plain old magical thinking that if God hadn’t existed he would have been created there in all his formlessness. On the other hand, down a dusty street, in a smoke filled arena thick with shouts of approval and dismay I saw a Burmese kick-boxing match (Lethwei). Even when a competitor is knocked cold he is carried to his corner and given a chance to keep on going. Between the kick-boxing and the temple we encountered a street festival, Hindu through and through with dark Indian migrants moving towards fire-walking ecstasy: thje festival of Thaipusam it seems, originating in Sri Lanka where the TherevadaBuddhism of Southeast Asia was also incubated. Of all the things we passed by or stopped and took-in, the images that will stay with me the longest will not be the temples and people sending up smokey hopes to the heavens, or the broad reaches of river, the cacophony of markets, or the rural roads and narrow city streets lined with stalls of micro-entrepreneurs, but the work — the unceasing, mostly backbreaking, pre-dawn to post-dusk work of a kind most of us have never remotely experienced. We took a long walk along the Yangon waterfront of the fabled Irrawaddy It doesn’t seem to dip below 95 F during daylight but the motion never ceased. 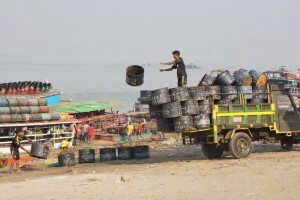 Young men in a human chain lifting impossible loads across rickety gangways, women peeling, frying, serving every imaginable morsel of unidentifiable species, bike and motorbikes, trucks, skip-loaders and old jeeps loaded and reloaded. Most of the work was done in bare-feet or thonged-sandals; most everyone wore the longyi, men and women alike. It’s an ankle length wrap-around skirt which I can’t even walk upstairs in without tripping. Carting a chest of drawers down a slipper gangway? No problem for the Burmese. 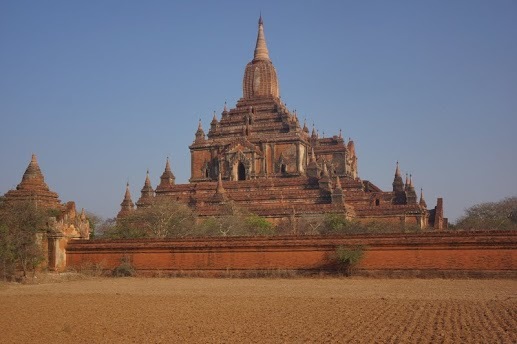 Bagan, a short flight from Yangon, although once the capital of what became Burma is much more of an antiquities site with tourists beginning to pour in to see thousand year old temples and pagodas. UNESCO is holding off on World Heritage status because much of the recent, come-hither, renovation has been more fanciful than faithful. Despite the heat and dust it was a chance to be out of a city and see rural life, much of it going on as it has for centuries. Bikes are replacing pony carts in most places. 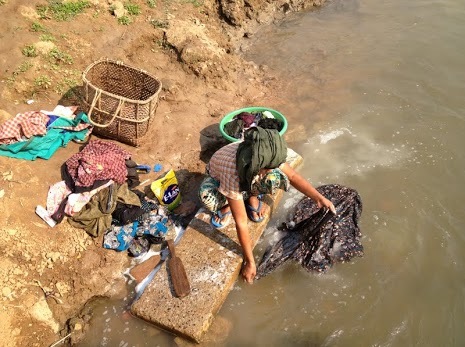 Women still wash clothes in the river using stones as the scrubbing boards. And then there is Aung San Suu Kyi. 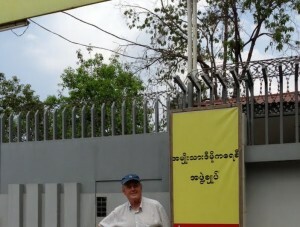 Standing outside her compound in Yangon was my moment of spiritual shaking. If you haven’t seen The Lady, a 2011 film by Luc Besson, much of it filmed surreptitiously in Burma though the interiors were done in a fully reconstructed home in Thailand, please do. And though she is being criticized recently by her own countrymen for not taking a more vocal stance against the recent ethnic violence in Myanmar her fifteen years of resolute endurance of house arrest in order to be the witness the Burmese people needed to push forward their still fragile democracy earns her merit far beyond what most of us can even dream of.